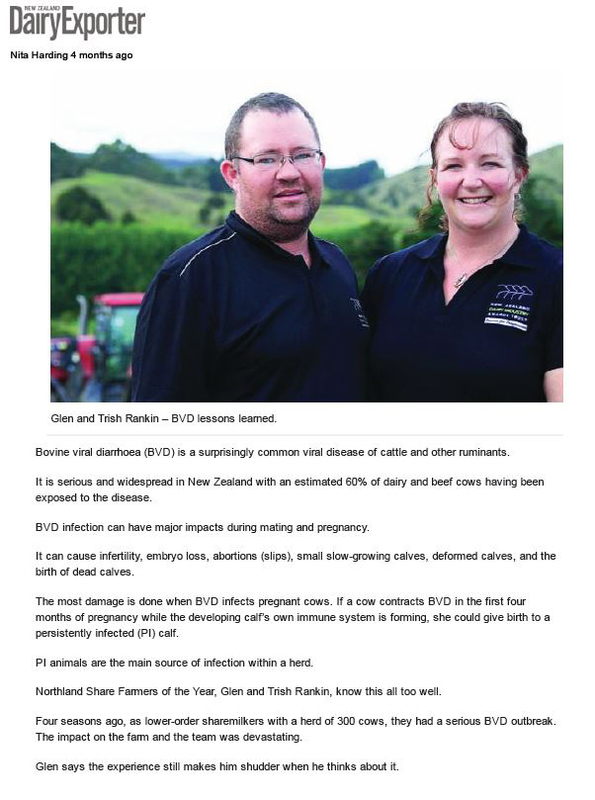 BVD is one of the most important viral disease of cattle in New Zealand. 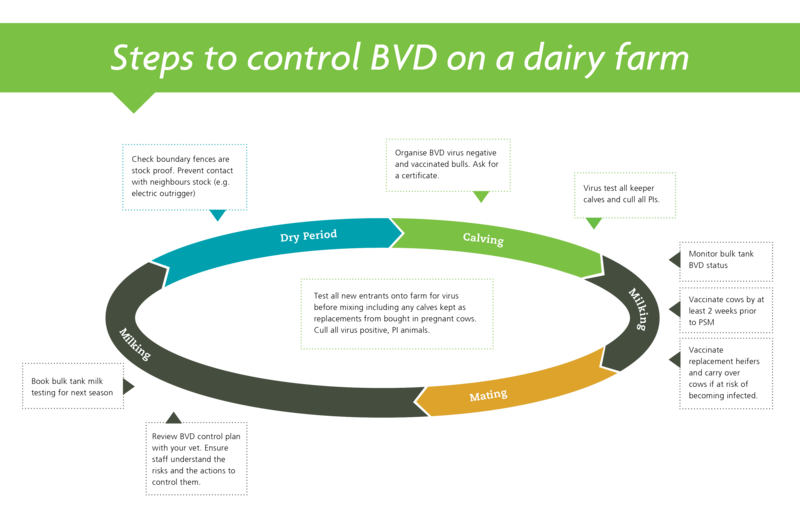 The good news is that BVD control at a farm level is very possible, practical and cost effective. Estimates put the annual losses for dairy farmers at around $127 million, with losses of $70,000 annually for each average sized infected herd. 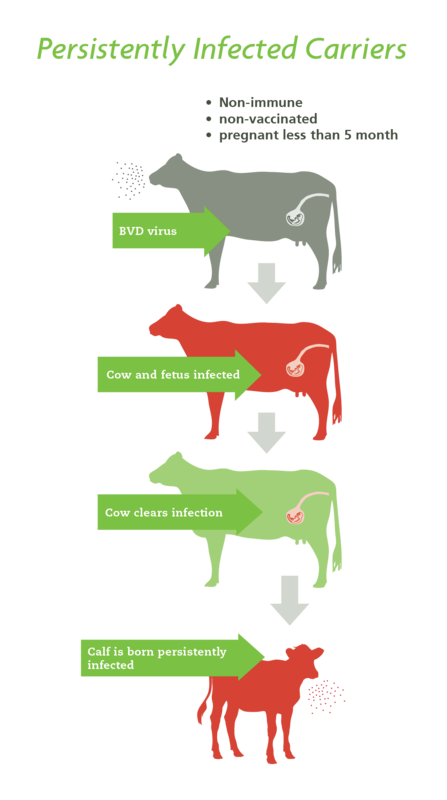 BVD is a serious and widespread disease in New Zealand, around 80% of New Zealand’s dairy and beef herds have been exposed to BVD. Infection with BVD can cause reproductive losses, an increase in general disease, reduced growth rates, and lowered milk production. BVD is often a ‘hidden disease’ preventing full production in a number of ways, often without attracting the attention of the farmer or veterinarian. The disease is maintained in the herd and spread to other herds by persistently infected (PI) animals. This can occur through brought-in stock or contact across the boundary. Cattle such as replacement heifers grazed off farm where they become pregnant, are also a possible PI animal source for the farm of origin. PI animals excrete large amounts of virus throughout their lives. PI animals occur when an early pregnant (fetus less than 4 months) uninfected cow gets infected with BVD. The resulting calf is often born a PI. The cow or heifer may not have shown any obvious signs of BVD infection at the time. To control BVD, the formation of PI calves must be prevented by making sure cows in early pregnancy do not become infected with the virus. A number of things can be done to control BVD: testing animals, monitoring the BVD status of the herd, managing the health status of animals coming onto the farm, and vaccination. The good news is implementing just some of these will make a difference. Ask your veterinarian to work through this process with you – they have tools to assist. More information for farmers and veterinarians. Northland Share Farmers of the Year, Glen and Trish Rankin, know this all too well.